I am not sure what breed or gender my rabbit is. Hi there, I got my rabbit over a year ago. I bought it at a local pet store, and the people working there could not seem to fill me in on the gender and breed my rabbit is. Although someone working there did say that my rabbit was a dwarf, but nothing specific. At the moment, I can't tell if my rabbit is male or female. Is it possible my rabbit could be a mix between a mini rex and a dwarf? I have no idea and so far I hve looked up as many gray, medium sized rabbits with short ears but nothing seems to match what I am looking for. I am hoping my description is enough- if not, I do have a few pictures of my rabbit. oh and by the way: if the picture uploaded says "Skronk", that is my rabbits nickname as it tends to make a pig like sound when it gets mad. Comments for I am not sure what breed or gender my rabbit is. But, my rabbit's fur is not as sleak and shiny as the mix. 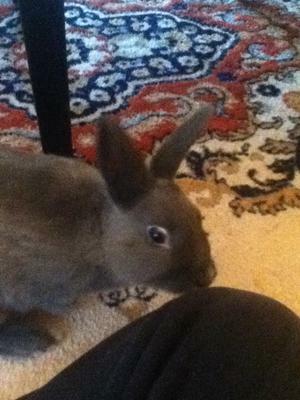 Also, it has been established that my rabbit is a male. Maybe a vet or some breeder could help clarify the breed? The pet store was way off with the whole dwarf ordeal. My rabbit is medium sized.